Northern Rhodesia (now Zambia) is one of the most beautiful and peaceful counties in Africa. It has vast areas of open plains in which huge herds of wild game roam. The landscape is laced with lakes, rivers, streams, rapids, waterfalls and swamps. It has enormous pockets of dense bush consisting of tall trees, clumps of bamboo, and is dotted with ancient anthills built by prehistoric ants in the mists of antiquity. Northern Rhodesia, a landlocked country with crisp air, quiet stillness, and endless sunshine is situated between the Tropic of Capricorn and the Equator, and stretches from the golden-brown Zambezi River in the south to the silver shores of Lake Tanganyika in the north. At an altitude of 1000 –1600 metres above sea level, 10 – 18 degrees south of the Equator, it offers a magnificent temperate climate with a high annual rainfall and little humidity. This land of lions, elephants, buffaloes, rhinoceroses, and the most deadly snakes, including the black mamba, is no place for the faint-hearted. Northern Rhodesia is the domain of Africa’s largest and most ferocious man-eating lions and in many areas these lions reigned with terror. In Barotseland, the western plateau of Northern Rhodesia, the ‘Kazangula Killer’, a gigantic wounded lion that found people to be soft targets, plagued primitive rural areas. It devoured about 50 people simply by creeping into a village at night, and removing a sleeping occupant from its hut and dragging it off. Fortunately, a European hunter eventually managed to get the great beast in the sights of his hunting rifle, thereby restoring peace to those living in the bush. In 1909, Chiengi Chali, a pale-coated lion devoured 90 Africans, before it was finally killed in a gun-trap. The people were reluctant to hunt the lion or report the killings because an influential old chief, on his deathbed, vowed to transform himself into a lion and kill his enemies. At Mporokoso, where the whole species of lion appeared to be man-eaters, about 10 Africans and a few European men were killed every year. Many villagers were careless in regard to taking pre-cautions against lion and crocodile attacks, but they eventually learnt to build thorn-bush stockades around their villages for protection. In the Kasama district, a lion that had been wounded by a missionary at Kapatu continued on its killing spree and carried off about 80 Africans before it was shot in 1922. In this same district another lion named Mishoro Monty claimed over 100 victims between 1926 and 1929, but was eventually poisoned. In 1943, the bold Namweliyu (The Cunning One) entered villages in broad daylight and bit off people’s arms and legs before sauntering off with the torsos. 43 people fell victim to Namweliyu. In 1954, a lion ate an African girl in a school dormitory at Mpika, near Shiwa Ngandu, (Lake of Royal Crocodiles). In that area, a lion chewed the brass doorknob on a front door of a European’s house. Although there was an abundance of buck for the lion to feed on, they preferred to enter huts and houses and feast on humans. Cattle farmers paid hunters well to destroy marauding lions. 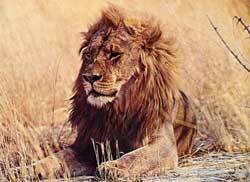 Huge prides of lions were killed all over Northern Rhodesia from Victoria Falls to Lake Mweru in the north. In the Zambezi Valley, the people build their huts on stilts twenty feet high, but the hungry lions were still able to leap up onto the platforms and pull their victims down. Living close to the bush, we lived close to wild animals. One Friday morning, while women were doing their weekend shopping, a thin and mangy moth-eaten old lioness walked into the old open market place, a construction of poles, corrugated iron and thatching. There was a huge commotion and people screamed and scattered. A policeman came out of the boma * and shot the lioness, which was then hung up on display for all to view.